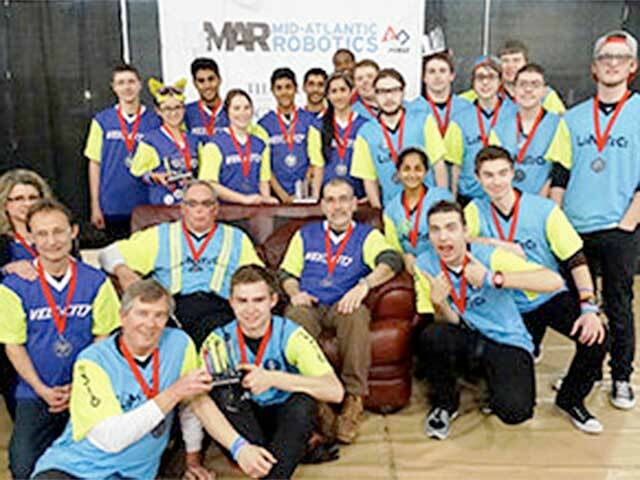 After taking silver, two South Jersey Robotics teams – Team 316, the LuNaTecs, from Carneys Point and Team 5420, Velocity, from Bridgeton — earned the right to compete in the Mid-Atlantic Robotic District Championship at Lehigh University in Bethlehem, Pennsylvania, April 9-11, 2015. Pictured, LuNaTeCs, from left, top to bottom, Alan Hinde, Justin Pharo, Dan Weick, Zach Kuleba, Maria Mathews, David Capaldo, Billy Krimson, Eric Fogg, Christian Steward, Jake Morris, Mike Marandola, Conor Townsend and Wyatt Retkowski. Velocity: from left, top to bottom, Joe and Stacey Valdez, Terry Kientz, Jacob DuBois, Sarah Valdez, Dhruv Patel, Cara Kientz, Anuj Patel, Sidhdharthsinh Rathod, Sejal Menghani, and Shyheme Days. The teams competed at Upper Darby High School on March 27-28. 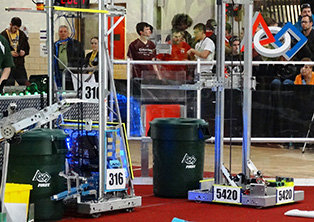 Team 316 — sponsored by DuPont, Boeing, PSEG, Warner & Co. Certified Public Accountants, South Jersey Robotics and Salem Community College – placed 2nd out of 36 teams at the end of qualification matches. They chose sister team 5420, seated 15th at end of qualifications, as their alliance partner. Team 5420 is a rookie team sponsored by NASA, Cumberland County College, City of Bridgeton and South Jersey Robotics. In the end, the squads each took home silver, qualifying both teams for the district championships. Team 316 is in 15th position (among 120 teams) going into championships for the Eastern Pennsylvania, Delaware and New Jersey district. Team 5420 is in 37th place. Pictured, two robots ready to compete at Darby High School. South Jersey Robotics Inc. (SJR) is a 501(c)(3) non-profit established in 2008 to enhance Science, Technology, Engineering and Math (STEM) learning and careers in Salem, Gloucester and Cumberland counties. Today, the organization sponsors 10 community robotics teams in elementary and high school grades, engaging more than 70 students. Through partnerships, SJR is striving to double the number of students and teams in the next several years. 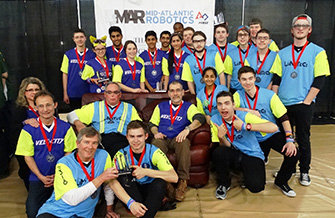 To show support for this nonprofit and to learn more about being a sponsor, mentor or to join the teams, visit the website at SJRobotics.com or email South Jersey Robotics at sjrobotics@gmail.com.